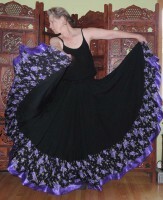 Spinning Skirts. These are like Falcons to the 25 yard skirts fluffy Peacock or Ostrich. Designed for clean high flight; pure and simple. with a weighted hem and springy best quality rayon challis. All banded skirts are not created equal! Try these to experience what Spinning is all about! Flight with color! This new Flying Skirts creation adds a world of color combinations, giving you a colorful skirt with a contrasting brocade band at the hem! Your choice 10 yards, the absolute best for full out hands free spinning, 15 yard for hands on Gypsy spins and skirt work, 20 yards for over the head Gypsy skirt work!. The adjustable elastic casing fits hips up to 60 inches. Order by Length. Price $87- $169. This skirt FLYS! 3 full tiers, with a weighted hem. 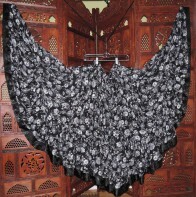 Made from springy best quality rayon challis. Your choice 10 yards, the absolute best for full out hands free spinning, 15 yard for hands on Gypsy spins and skirt work, 20 yards for over the head Gypsy skirt work! Colors: Black, White and 25 hand dyed colors! 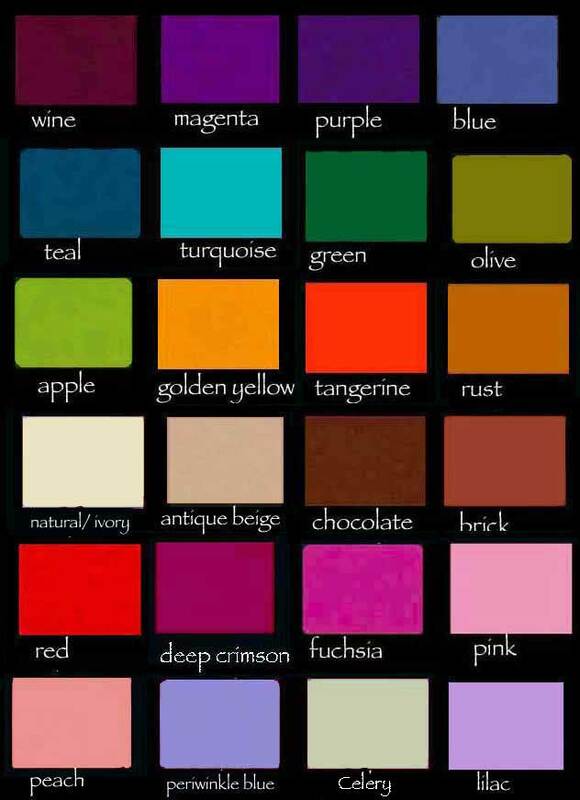 Click here for color swatches, and for 2015 color swatches . The adjustable elastic casing fits hips up to 60 inches. Order by Length. X-short 32 inches, Short 34 inches, Medium 36 inches, Long 38 inches Price $89-$169. Beautiful All Floral Skirt. Made of flowing full flight rayon challis. Your choice 10, 15 or 20 yards at the hem, weighted with a band of satin Jacquard for effortless spinning! Size: The adjustable elastic casing fits hips up to 60 inches. Order by length, X-Short 32", Short 34", Medium 36", Long 38 inches, X-long 40. Price $139- $209. Matching Girls version available click here! Custom option you can add a band of polka dots to this style for $12. click here to see how! 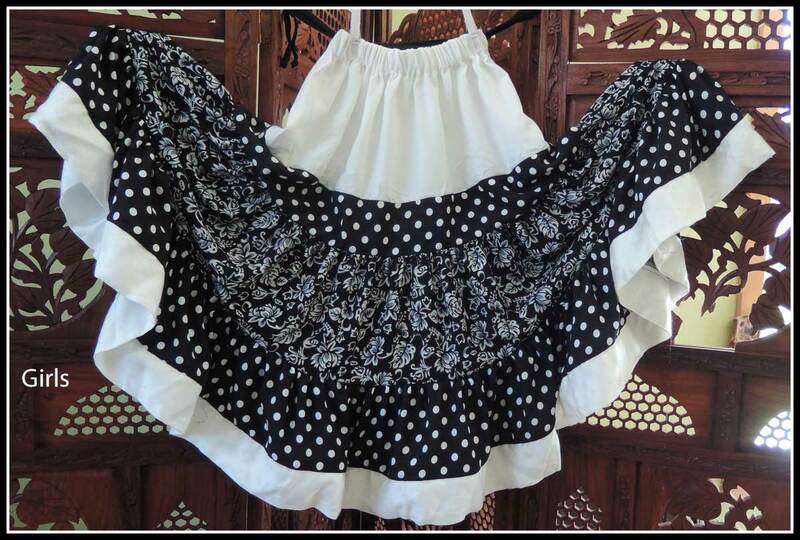 Complex Floral Skirts in a mezmerizing combination of patterns, solids and optional polka dots! 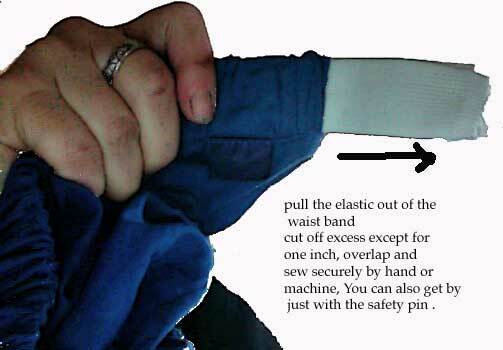 Two fullness cholces: 15 yards at the hem or 20 yards at the hem. Sizing: The adjustable elastic casing fits hips up to 60 inches. Length Short 34", Medium 36", Long 38" Xlong 40" Price $177- $229. One of a kind show stoppers! My goal is to ellicit compliments and oos and ahs with these skirts- Especially while twirling! All are one of a kind, so when they are gone they are gone, but if you really really love a skirt that has been sold or want it in another length, I can duplicate some, but not all of them, email me to find out. Check the drop down menu to see what is in stock. 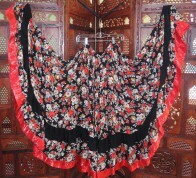 Floral Circle Skirts for Extreme Gypsy skirt work! Made from springy best quality rayon challis. 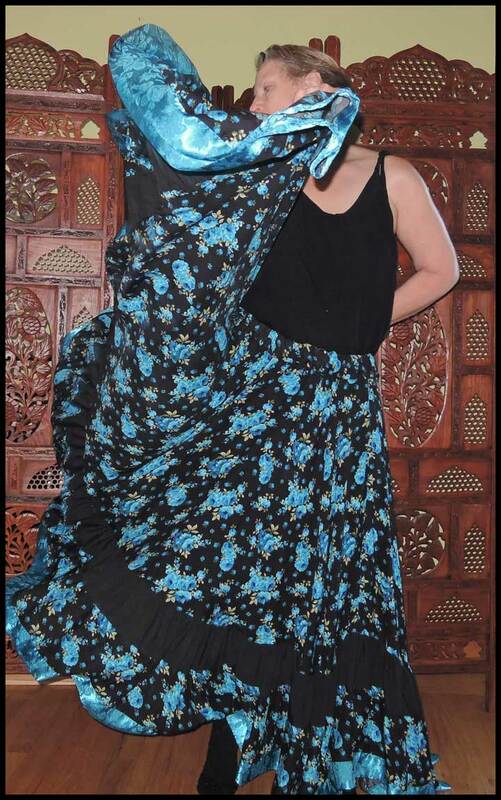 Your choice; single circle for hands free spinning and shoulder high skirt work and 1 1/2 or double circle for over head skirt work, ultimate tucking and extreme Gypsy skirt work! edged with a band of satin jaquard! Size: The adjustable elastic casing fits hips up to 60 inches. Order by Length Xshort, 32 inches, Short 34 inches, Medium 36 inches, Long 38 inches Price $162-$237. 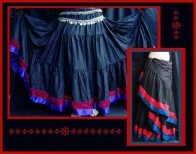 I can make a girls 1/2 size version of this skirt for $81 email me at gwen@flyingskirts.com with your request! 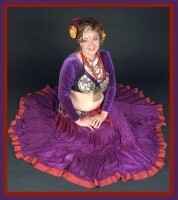 Extreme Circle Skirts for Extreme Gypsy skirt work! 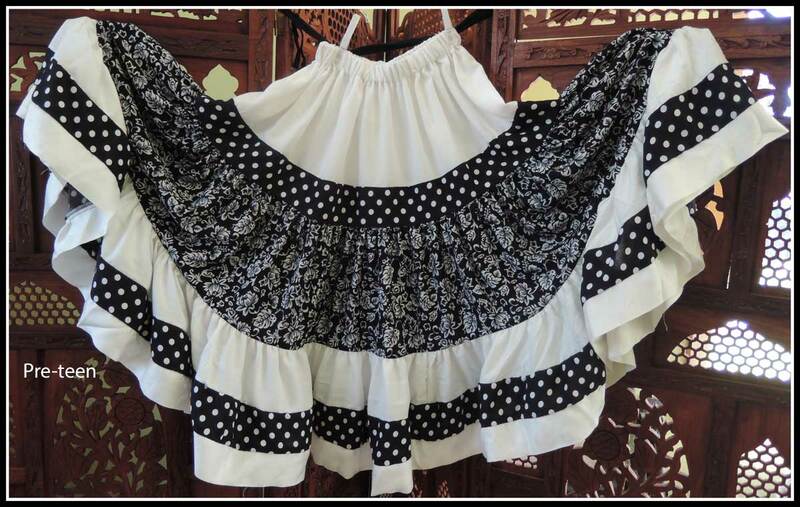 Ruffle Circle Skirt Made from springy best quality rayon challis. Your choice; one cicle for hands free spinning and shoulder high skirt work, 1 1/2 or double circle for over the shoulder shimmys and over head skirt work, ultimate tucking and extreme Gypsy skirt work! Finished with a deep floral or polka dot ruffle at the hem, edged with a band of satin jaquard! Size: The adjustable elastic casing fits hips up to 60 inches. 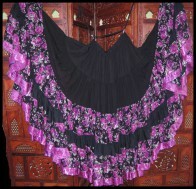 Order by Length, Xshort 32 inches, Short 34 inches, Medium 36 inches, Long 38 inches Price $157-$219. -- Choose a Skirt length -- Short Medium length Long Xlong -- Choose a Hip size -- adjustable up to 40 inches adjustable up to 60 inches -- Choose a Mirror Trim and Band Color -- wine magenta purple turquoise teal olive apple rust chocolate antique beige brick golden yellow tangerine deep crimson fuchsia pink peach periwinkle blue celery lilac. 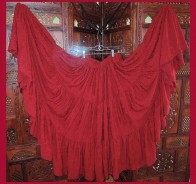 Three tiered skirt in sumptuous hand dyed silk.10 yards at the hem for full flight , or 15 yards for outrageous flourishes!, finished with a band of contrasting brocade. Just the right weight for full flight spinning, offers dazzling color combinations.